When Lisa and Charly Kleissner need to make a big decision, whether it impacts family, investments, or philanthropy, they first look to their values. Since one of their strongest values is making a positive impact with everything they do, it should not be surprising that the Kleissners have made a key decision to ensure that all their assets are working toward improving the environment and the lives of people throughout the world. 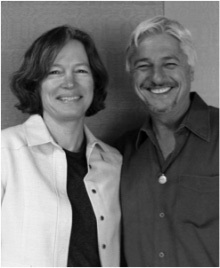 In 1999, Charly was working as a high-tech executive in Silicon Valley, and Lisa was working as an architect. Each had investments in several startups, and when those companies went public in 1999, their financial picture changed dramatically. Charly and Lisa worked with Navitas, Ltd., a values-driven wealth advisory, to figure out how much their family needed to support their lifestyle. As a result, they determined that they could put 70% of their assets into charitable instruments. These instruments include a family foundation, the KL Felicitas Foundation—felicitas is Latin for ‘happiness’—and charitable remainder trusts. The vision informing the Kleissner family’s philanthropy was not always as focused as it is today. Initially, Lisa’s giving, largely focused on the Bay Area, was separate from Charly's. Also, she had an interest in impact investing, but had not yet found a way to incorporate this in their investment strategy. Through a series of meetings with their philanthropic and investment advisors, a unified vision for the foundation emerged, where the couple’s and the foundation’s assets were aligned with their joint values and philanthropic goals. This excited the Kleissners, who were beginning to see how productive their collaborations could be. “We have very complementary skills,” Charly says, “which allows us to accomplish things together that individually we otherwise could not do.” They decided to focus on enabling social entrepreneurs and social enterprises worldwide to grow sustainably, with an emphasis on rural communities and families. Their two adult children are actively engaged in the philanthropic decision-making, and the Kleissners credit this to early exposure and engagement with global issues and philanthropy. As Lisa states, “Our approach with our children was not to talk about philanthropy, but to make it experiential while they were still a captive audience... before they went off to college!” Their exposure included travel and work abroad, and engagement with many of the family’s early philanthropic investments. The Kleissners' approach to their investments and their capacity building in the fields of entrepreneurship, social enterprise and philanthropic leadership is a highly leveraged use of their time, talent and capital. For a small foundation, KL Felicitas is punching well above its weight and making the world a much better place. Copyright © 2011 Rockefeller Philanthropy Advisors. All rights reserved.